Read TimeOut NY’s Preview of the Event. JG Thirlwell’s Manorexia will be performing live at Le Poisson Rouge, celebrating the release of The Mesopelagic Waters on Tzadik. The show will be on April 4 2010 at 7pm and tickets are $15.00. 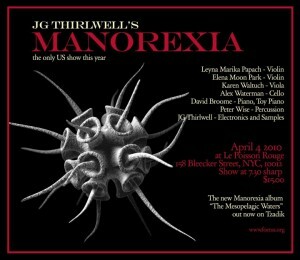 This is the only Manorexia show scheduled for the US in 2010. Buy advance tickets at Le Poisson Rouge’s site.